OSA: "Where Sky and Yorkshire and Water Meet"
Published in December 2011, and available from Oxbow Books or direct from On-Site Archaeology priced at £25. Please contact Oxbow books or email us for details. This volume written by Chris Fenton-Thomas describes the findings from work near Melton, East Yorkshire. It tells the story of the Melton Landscape from Prehistory to the Present. New slip roads and roundabouts have been built to make the road safer. 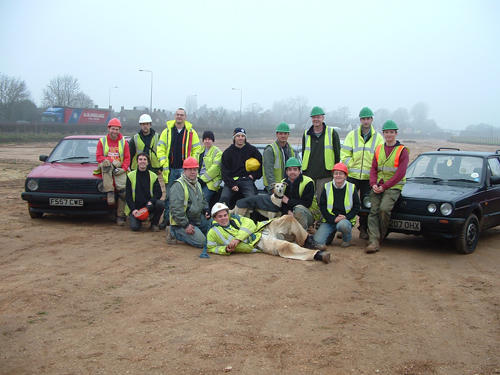 What drivers may not have known is that a large team also worked here to excavate archaeological remains affected by the roadworks. Archaeologists from On-Site Archaeology were on site from June 2004 to March 2005 during which time they revealed ancient remains from many different periods throughout the last 4,000 years. The site covered an area of just over thirteen hectares on both sides of the A63, making this one of the largest excavations ever undertaken in East Yorkshire. The analysis of the excavated remains has been underway since 2005 and this has involved detailed studies of pottery, animal bones, human bones, plant remains and a range of other finds. We have used radiocarbon dating and other scientific techniques to discover not only how people lived but also how the landscape changed from 2500 BC to the present day. The archaeological potential of the site was already known before work began on the road improvements. The lines of ditches buried beneath the crop in the arable field at South Lawn had been spotted on an aerial photograph, taken in 1976. This showed that the area north of the A63 was crossed by ditches running east to west in parallel with the modern road. They seemed to run along the side of an ancient and long forgotten trackway. This was crossed by other ditches running north to south. The layout of the ditches looked very much like other sites from the region, which are known as ladder settlements and date from the late Iron Age or early Roman period (c. 150 BC to c. 300 AD). Sites like these are important as they span the period of the Roman conquest and can tell us how the Roman occupation may have affected the lives of the people who already lived here. 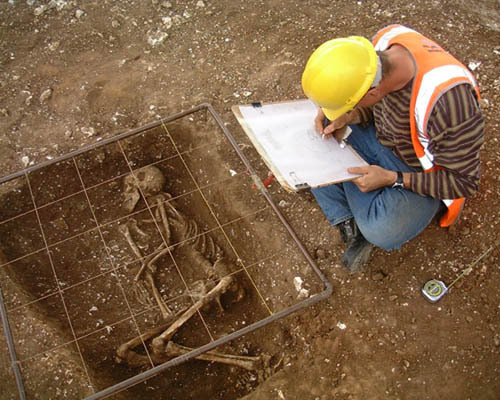 At Melton we had the rare opportunity to investigate the remains of a ladder settlement on a large scale. This confirmed that the site was occupied between about 100 BC and 300 AD. It also showed that the ladder settlement originated much earlier than expected. Furthermore, some elements, such as the trackway, survived for centuries, after the Roman period, until at least the seventh century AD.